The Color dialog lets you manage and pick up new colors. You can use it into five different modes: GIMP, CMYK, Triangle, Watercolor and Scales. It has an interesting eyedropper to pick up a color anywhere on your screen. twelve buttons show the last used colors. You may choose a color by clicking on one of these buttons or add the current FG or BG color to this history list. This dialog works either on the foreground or the background color. The “Colors” dialog is a dockable dialog; see the section Paragraaf 2.3, “Koppelen van dialoogvensters” for help on manipulating it. from the toolbox: click on the current Foreground or Background color. In the Windows menu, there is a list of detached windows which exists only if at least one dialog remains open. 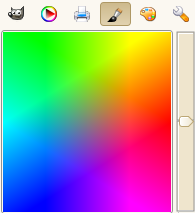 In this case, you can raise the “Colors” dialog from the image-menu: Windows → Colors. With the GIMP Color Selector, you select a color by clicking on a one-dimensional strip located at the right edge, and then in a two-dimensional area located on the left. The one-dimensional strip can encode any of the color parameters H, S, V, R, G, or B, as determined by which of the adjoining buttons is pressed. The two-dimensional area then encodes the two complementary color parameters. You get to this selector by clicking on the printer icon. The CMYK view gives you the possibility to manage colors from the CMYK color model. 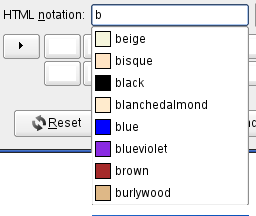 This selector uses the HSV color model. 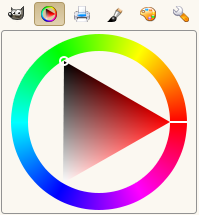 Click in the chromatic circle and drag the mouse pointer to select the Hue. Click-and-drag in the triangle to vary intuitively Saturation (vertically) and Value (horizontally). This color selector is symbolized by a brush. The function mode of this selector is a little different from that of models presented so far. The principle consists in changing the current foreground color by clicking in the rectangular palette. If the current foreground color is for example white, then it turns to reddish by clicking in the red color area. Repeated clicking strengthens the effect. With the slider, which is right apart from the color palette, you can set the color quantity per every mouse click. The higher the sliding control is, the more color is taken up per click. 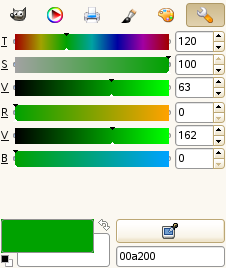 This color selector brings up a list of the colors of the current palette in the Palettes dialog . 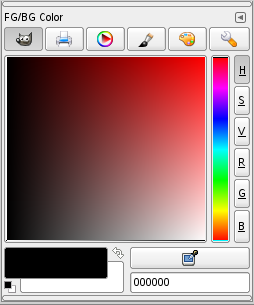 You can set GIMP's foreground or background colors by clicking on colors in the colors display. You can also use the arrow keys to move within the list of colors. This selector displays a global view of R, G, B channels and H, S, V values, placed in sliders. The color picker has a completely different behavior, than the color picker tool. Instead of picking the colors from the active image, you're able to pick colors from the entire screen. Right-clicking in the HTML Notation text box opens a context menu that allows you to edit your notation, particularly to paste a complex notation you have copied elsewhere. 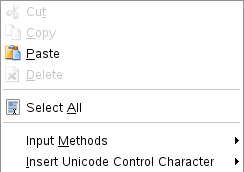 This menu leads to various Input Methods that allow you to use foreign characters, and to the possibility to Insert Unicode Control Characters. This is a vast field, beyond this help. Please see [UNICODE]. Right up you find a symbol, consisting of two arrows, with which you can exchange the foreground and background color. 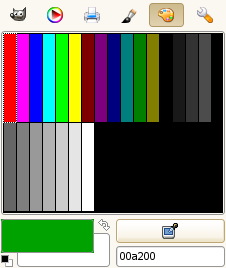 At the bottom left of the dialog, just below the foreground color block, you find a switching surface with two small, one black and the other white, partially overlapping squares. If you click on these, the front and background color are put back to black and white respectively.